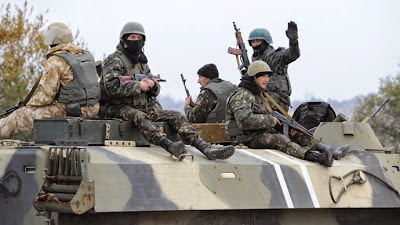 MOSCOW, Russia -- A leftist MP has said the US Senate’s decision to arm the Kiev regime should prompt ‘adequate measures’ from Russia, such as deploying military force on Ukrainian territory before the threat becomes too high. Ukrainian army soldiers sitting atop an armoured vehicle maneuver on the coastline near the eastern Ukrainian city of Mariupol on October 21, 2014. “The decision of the US Senate is extremely dangerous. If it is supported by the House of Representatives and signed by their president, Russia must reply with adequate measures,” Mikhail Yemelyanov of the Fair Russia party told reporters on Friday. “It is quite possible that we should return to the decision by our Upper House and give the Russian president an opportunity to use military force on Ukrainian territory preemptively. We should not wait until Ukraine is armed and becomes really dangerous,” the lawmaker stated. Yemelyanov also noted that in his opinion the US Senate’s decision to arm Ukraine had revealed that Washington wasn’t interested in the de-escalation of the Ukrainian conflict. “In a few years Ukraine will turn into a poor and hungry country with an anti-Russian government that will teach its population to hate Russia. They will be armed to the teeth and Ukraine and US reluctance to recognize the Russian Federation within its current borders would always provoke conflicts,” the MP said. The US Senate on Thursday passed the so called "Ukraine Freedom Support Act" allowing for the provision of lethal and non-lethal aid to Ukraine and imposing additional sanctions against Russia. The bill was passed by a unanimous vote, according to one of its main sponsors - Republican Senator Bob Corker. The motion is yet to be passed by the US House of Representatives. The bill was opposed by US President Barack Obama, who spoke before the White House Export Council on Thursday and said that the move would be counterproductive and create divisions with Washington's European allies. The resolution was adopted in accordance with the first part of Article 102 of the constitution of the Russian Federation. However, on June 25 the Federation Council voted to repeal the legislation following a request from Vladimir Putin. The Russian president instigated the move from a desire to discharge tensions in view of the three-party talks on a peaceful settlement in the East and South-East of Ukraine. Federation Council chair, Valentina Matviyenko, said after the June vote that Russia would continue monitoring the situation in Ukraine, but added that she personally didn’t believe that the Upper House would vote again to adopt legislation allowing military action in Ukraine.